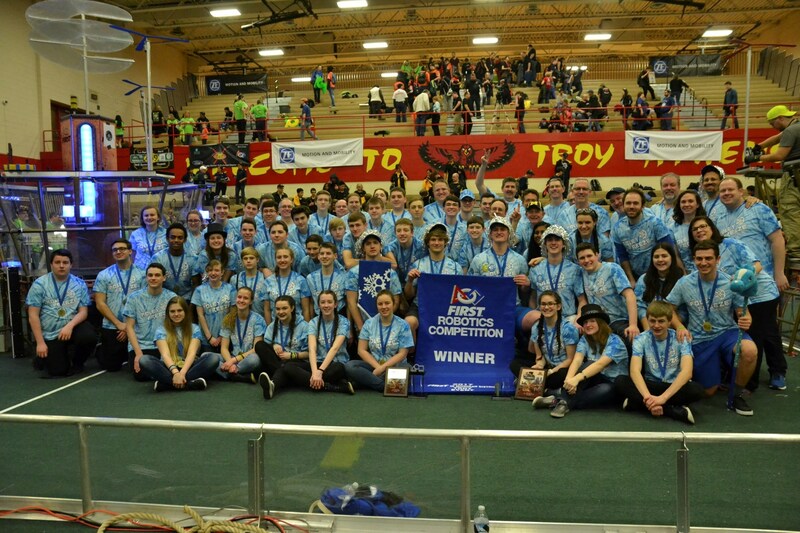 The award winning Bishop Foley Catholic Robotics team started in 2002 and is known as "Team 910 - The Foley Freeze." The club has competed in several competitions. One of the competitions was at the Georgia Dome, where they tied for third in the world against teams from 37 countries and 50 states. Currently there are approximately 65 students on the team. They have a very successful competition record and continue to be one of the top teams in the state and Midwest. Students learn skills in areas of manufacturing, mechanical and electrical engineering, computer programming, business, web development, marketing and much more. Team members continue to put their knowledge to the test in a variety of classes. Including physics, chemistry, mathematics, journalism, computers, and video production. Team members go on to receive numerous scholarships to engineering colleges, acquire employment at companies like GM, Google and NASA, and have earned U.S. Patents. The Foley Freeze are members of the national organization FIRST "For Inspiration and Recognition of Science and Technology." The Robotics team meeting dates and times vary, but are held in the Robotics Labs, rooms 127 and 229. Check the team's website for current details. For more details, please contact Mr. Crombe or Mr. Swift. Follow Team 910 - The Foley Freeze on the following Social Media accounts.